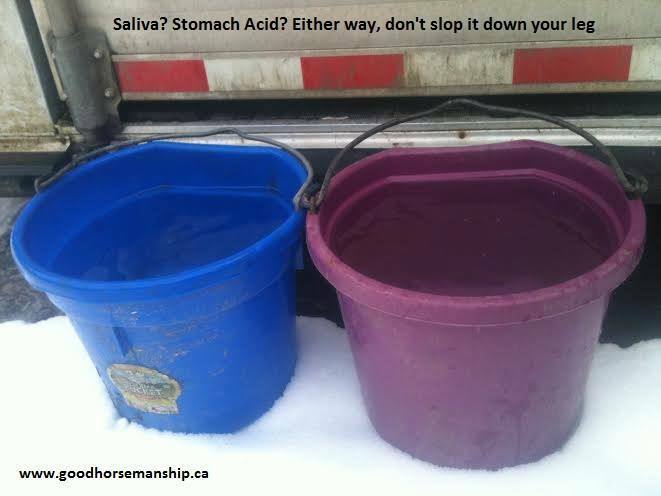 I found this great post on the Good Horsemanship Facebook page, which explains in simple terms how the horse's digestive system works and offers a great visual of how much stomach acid horses produce in a day! As you can see, it is important to ensure that horses have free choice access to forage (hay) throughout the day and night. For easy keepers, slow feeder nets are a great solution to slow down the eating and still ensure they always have something to digest. I actually find them useful for all my horses, easy keeper or not, as they help reduce waste and keeps them busy. I just use larger 2 inch hole nets for horses that don't need to lose weight. Hay consumption should be measured by weight, not volume or amounts of flakes, as the size and density of bales can vary greatly, even within a single crop. Hay consumption will increase in colder temperatures (every 5 degrees under -5C), since the digestive process also acts a 'fuel' for the horse's metabolism, helping maintain internal temperature. Basically, horses should never run out of hay or pasture, and will actually self-regulate their intake if it is always avalable (unless they have a metabolic condition which suppresses the insulin response mechanism). Last but not least, giving horses free choice access to forage makes for much happier horses and significantly reduces anxiety and stress at feeding time. We should all learn how to feed horses like horses! How's this for a visual you won't soon forgot? This is how much stomach acid a horse's body produces each day. Two standard buckets full.Why does this matter to you? Your chosen feeding practices can have a direct impact on whether this naturally occurring stomach acid is useful, healthy, and beneficial to the horse's well-being, or not.Here's how: Horses only produce saliva when they chew, and the more the horse chews, the more saliva is produced. In fact, if you allow your horse access to forage ad-lib (how he has evolved to eat), the horse will produce two buckets of acid-buffering saliva every day.On the other hand, horses who are fed set feedings (with fasting in between) have greatly limited chew time, and therefore don't produce this volume of saliva. The horse's stomach is relatively small, and only lined with a protective coating on the lower 2/3's. Excess and 'unemployed' acid can splash up onto the unprotected top 1/3, resulting in pain, ulcers, and psychological distress for the horse - all possible causes for aggression at feeding time.Regardless of the amount of chew time a horse has each day, his body still produces these two buckets of stomach acid - 1.5 liters every hour, 24 hours a day. Given that we are the ones with the thumbs, and we control turn out, feeding schedules etc. it is solely up to us to ensure the horse has the option to chew as nature intended.What can you do to increase your horse's chew time, balancing out these buckets so-to-speak?And watch how you carry those!